Sri Lanka can be thoroughly enjoyed by all types of budget travelers because it has attractions for everyone, a rich history and culture, and a wide variety of water sports that are becoming increasingly popular with tourists. 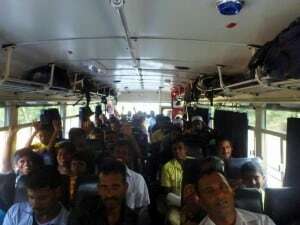 Our month-long travel through Sri Lanka saw us encounter some of the cheapest food and transport in Asia, but it also had the most overpriced accommodation choices. First and foremost, when you arrive in Sri Lanka, my advice is get out of Colombo! 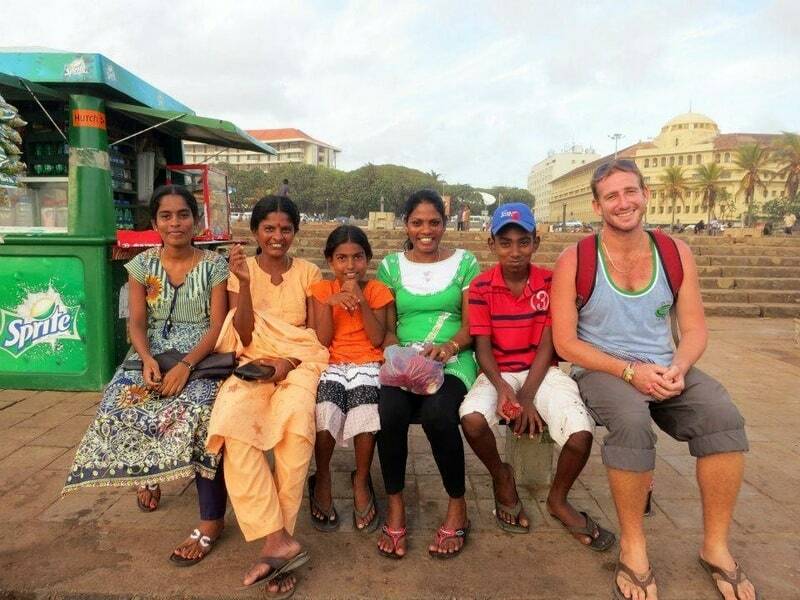 You may be able to spend a day there in the museums or walking the busy streets amongst the locals, but if you are short on time or money either stay the night outside of the main town in places like Mount Lavinia or catch one of the many buses or trains going north, east, or south. Sri Lanka is a round island and can be traveled in many directions and methods. For instance, traveling from Colombo to Kandy is definitely easier and more comfortable by train than by bus and affords spectacular views as you wind up the mountain. Tickets are dirt cheap, and if you feel like splurging you can even buy a first class ticket that has air conditioning and wi-fi! 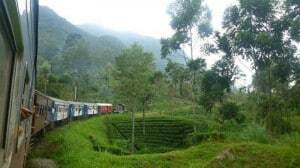 Check out Seat 61’s Sri Lanka page for informative details on train travel. A spectacular view from the train of Sri Lanka’s tea plantations. If a train doesn’t go the direction you want to travel, be sure that a bus certainly will. Locals told us that most of the buses have been donated second hand from South Korea and there certainly a lot of them travelling the roads! There are both private and government run buses. The price can vary significantly, so be sure to check around before you choose a bus. Government run buses are mainly red in colour, have open windows and bench seats, whereas private buses can be minibus style with air conditioning but are around twice the price. Also add at least an hour or two to the listed travel time as traffic congestion and full to the brim buses will add to your travel time. Sri Lanka is well-known for its tasty food, but don’t be fooled into thinking that you need to go to high-class restaurants to taste the best Sri Lanka has to offer. The most traditional and easiest food to find is rice and curry. Some of our best meals were at rundown sheds! In order to find good food, keep an eye out for busy open air gatherings with large crowds of mostly men. 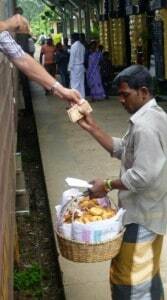 They will shovelling rice and curry with their hands in restaurants that look like convenience stores. The Sri Lankans, it seems, only ate a couple of meals a day, and in order to get the best quality and most variety of dishes, you have to eat as close to noon as possible. Often we would go get curry and rice and there would be no pappadums left. It was also a practice of ours to only eat vegetarian. Not only were the vegetable dishes extremely tasty and diverse, but they were cheaper! Be aware that some restaurants in tourist areas require two hours notice to cook your curry and rice, especially for dinner, so be sure to decide where to eat early or you may end up eating cheese crackers in your room! 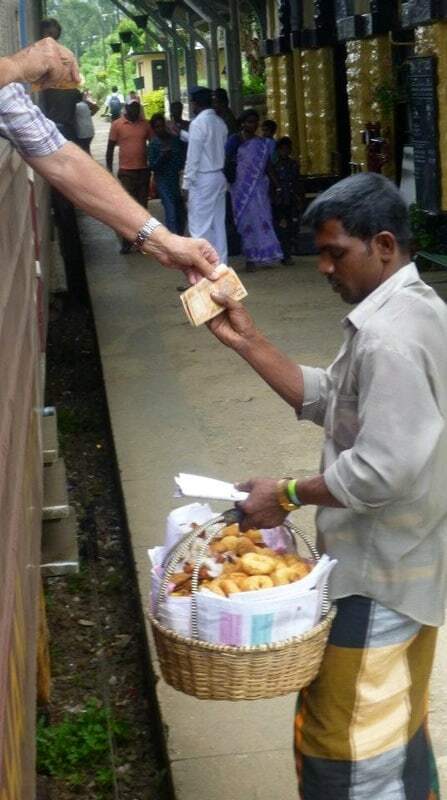 When on the road, vendors will board the trains or buses selling dhal cakes, roti, drinks, and biscuits for reasonable prices. Accommodation is the main expense you will encounter in this highly competitive market. Be aware of touts that will try to tell you that the guesthouse you are looking for has burnt down or that the price is significantly higher due to ‘festival times’. All the guest houses we stayed in were for a minimum of Aus$16 and did not have hot water. If you do want hot water, be prepared to pay twice the price. The other major expense you will have is tourist destinations such as national parks and temples, so if you are short on cash be sure to research exactly what you want to see before traveling hours on the bus. For example, the Sigiriya entrance charge is an overpriced Aus$30. Fortunately, we knew this before arriving and were prepared because it was an amazing experience. To keep our budget under control, we made an effort to see free attractions, such as the incredible Galle Fort. Having booked a ticket to Sri Lanka only 9 hours before we flew, we can testify that is quite easy to travel around Sri Lanka on a tight budget and still experience the incredible sights and a thriving culture. Rosalie Reynolds is an Australian currently living in Hokkaido, Japan. 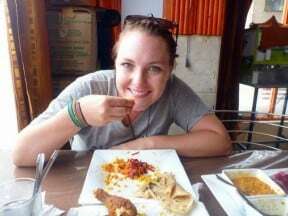 She spent six months travelling through Malaysia, Cambodia, Vietnam, Thailand, Laos, and Sri Lanka with her boyfriend Hedley. They plan to continue their travels through Nepal, India, and South America soon. thanks for your suggestions, tips and advice…looking forward to Sri Lanka. did you travel the entire country? where did you find the best culture, beaches and best deal? Thanks for the comment. Sri Lanka looks great, doesn’t it? Unfortunately, I didn’t write the post, so I don’t know that my advice on traveling there would be all that beneficial. I hope you enjoy your trip! Hi Evan, sorry for the late reply. We travelled through Sri Lanka for a month starting in Colombo (mount Lavinia) caught a train to kandy to see the esala perahera. From there we caught a train to nuwara eliya for two nights (tea plantations) then onto haputale where you can go to the Horton plains but we didn’t go. From there we caught a bus to arugum bay via wellawaya. We stayed in arugum bay quite a few nights as it was beautiful weather, nice accommodation for reasonable price and good surfing. We travelled then onto Marissa beach near Galle for a week. Very nice! After that we caught a bus to hikkaduwa another beach side town. We then wanted to go to Sigirya so we caught buses to kandy to stay overnight and then travelled to the unesco sight. We did the unthinkable and travelled onto Trincomalee late in the afternoon which I wouldn’t recommend as it was hard to find accommodation on dusk. We stayed there for a week and a half before heading back via bus to Colombo to meet our flight. Kandy had the best culture, nuwara eliya had the best views of tea plantations, Marissa had the best beach and Galle had the best reef. 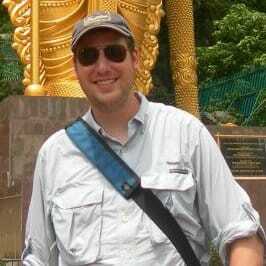 Loved your Sri Lanka post. The tea plantations look beautiful and great that you can travel through them and see them by train. You’ve certainly encouraged me to visit at some point. Glad you liked it Pippa! The tea plantations and the landscape are quite different to the rest of Sri Lanka and much colder! When we were there in July we had to wear jeans and jumpers, my boyfriend even bought gloves from the cheap markets whilst in the rest of Sri Lanka we were sweltering! Sri Lanka is an amazing place to travel. Especially the hill stations of Ella and Nuwara Eliya which were my favorite destinations there.